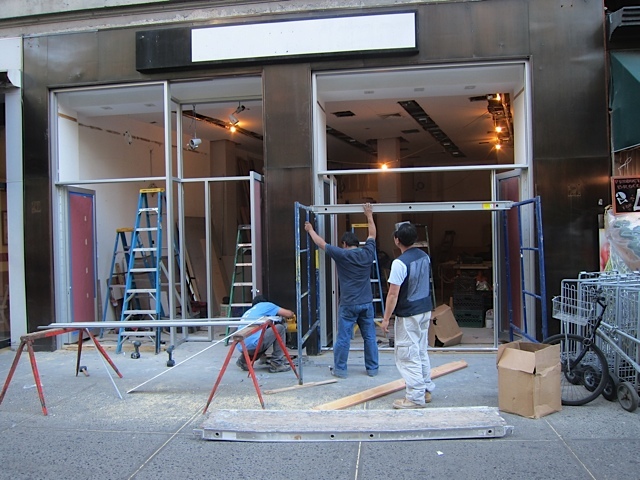 On the site of the doomed Teagschwendner, work of some kind begins. Masking their excitement with blase, the overjoyed populace passes. 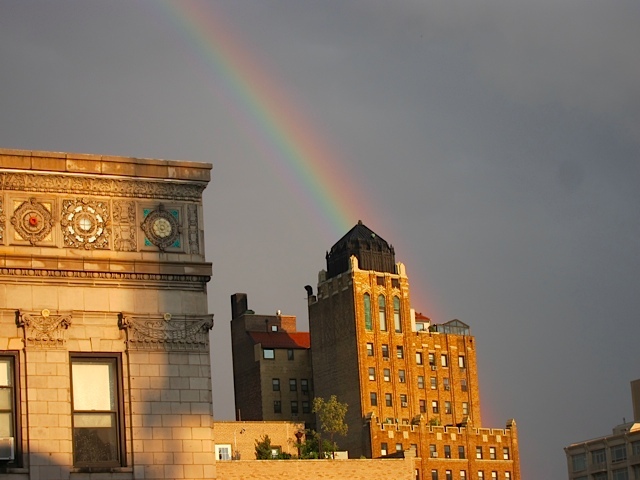 And has more than a year not passed since this rainbow presented itself to the city? 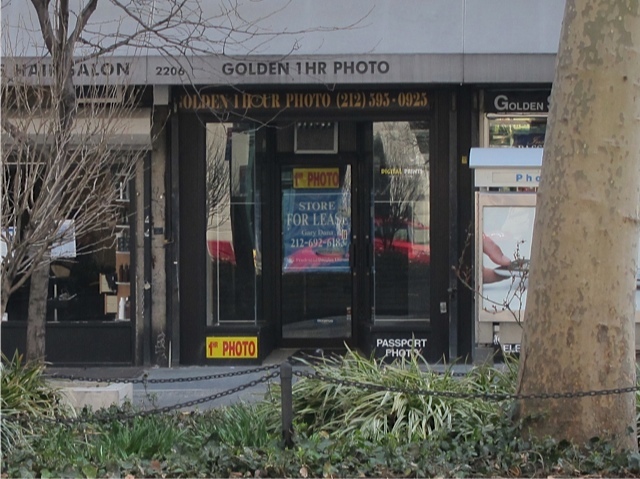 West 79th St., in front of the only Chase branch for two blocks in any direction. 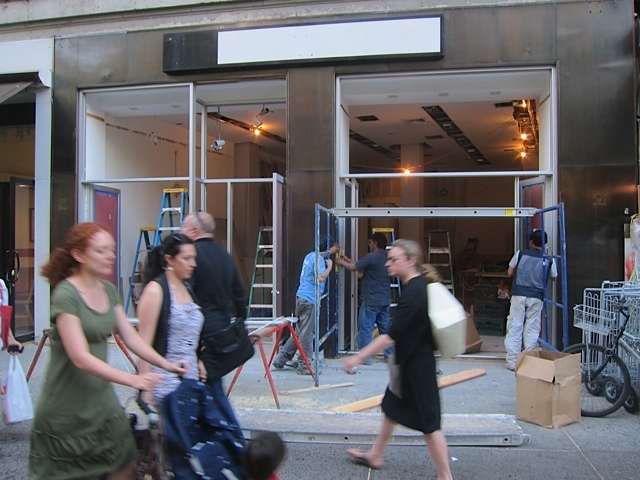 Filene’s will have been on the northeast corner. 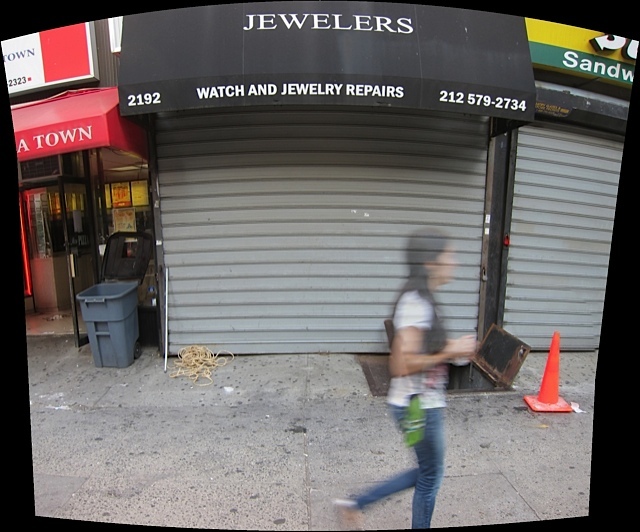 79th, between Broadway and Amsterdam. 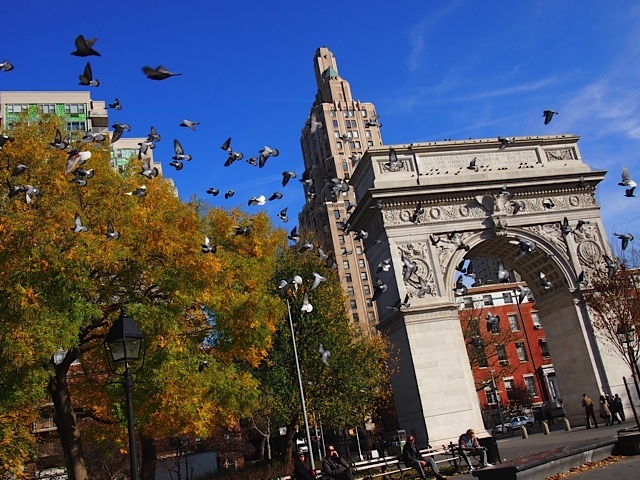 Pigeons swoop dramatically across the world-famous Gateway McDonald’s Arc de Triomphe in Washington Square. 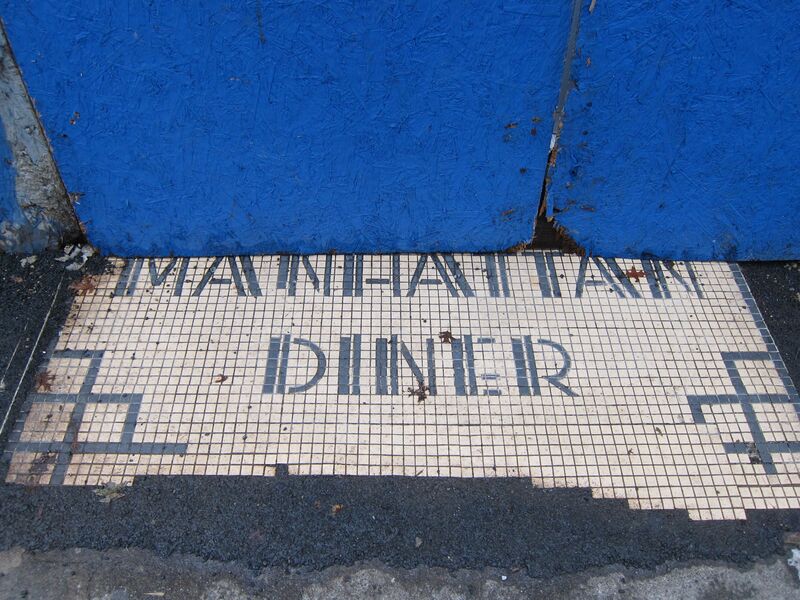 The tile floor from the entrance to Manhattan Diner remains for now. Clark Kent works construction now that print media is dead. Tourists exit bus and approach Central Park. Santo and the guy in all the photos with celebrities had been at SE corner of Broadway & 78Th for 30 or 35 years, depending on who you asked. 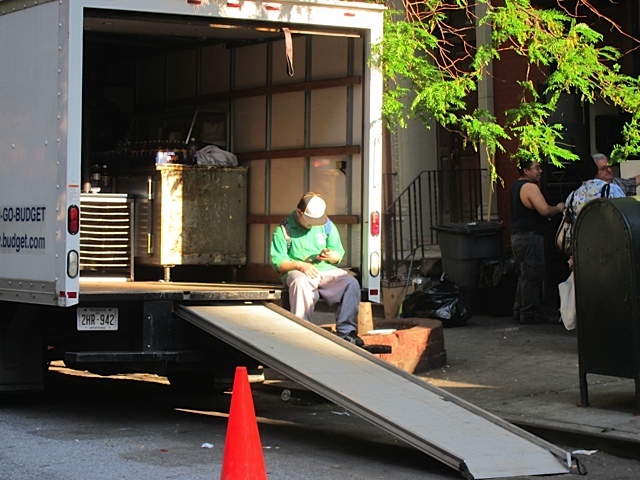 This past Friday, they abruptly closed and loaded the contents of their prototypical NY pizza joint onto a rented truck. 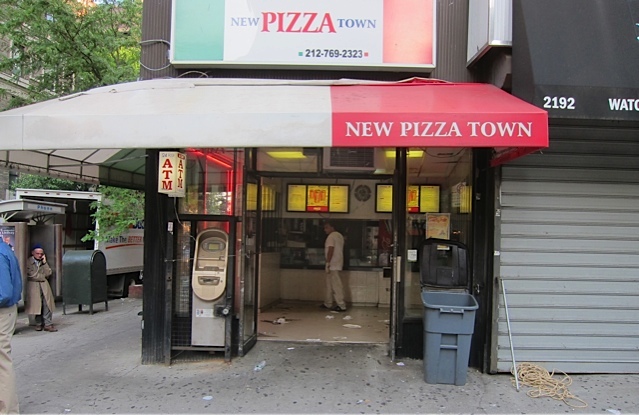 In little more than a decade I ate 1439 slices of their pizza. 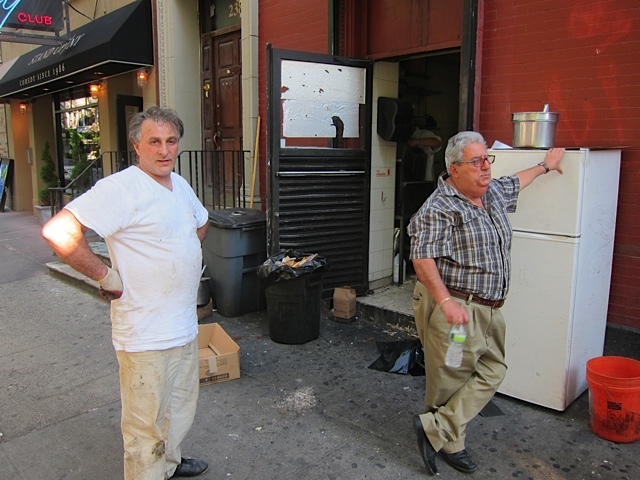 Santo on right, guy in all the photos on left. 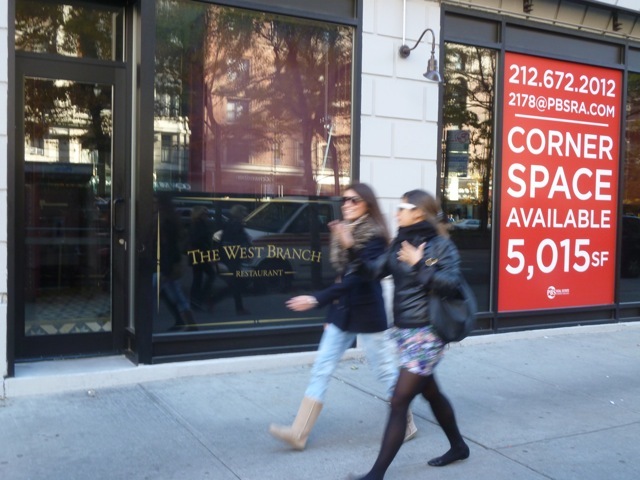 A stretch of shops on Amsterdam Avenue between 78th and 79th has emptied recently. 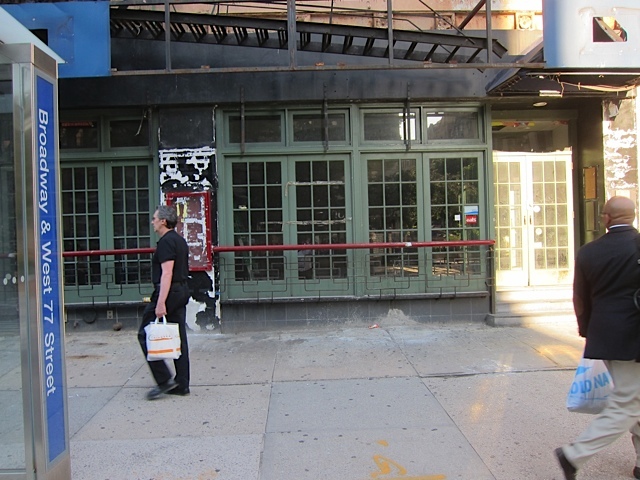 Including the dearly departed Starlight Diner, those storefronts occupied 2/3 of a block. 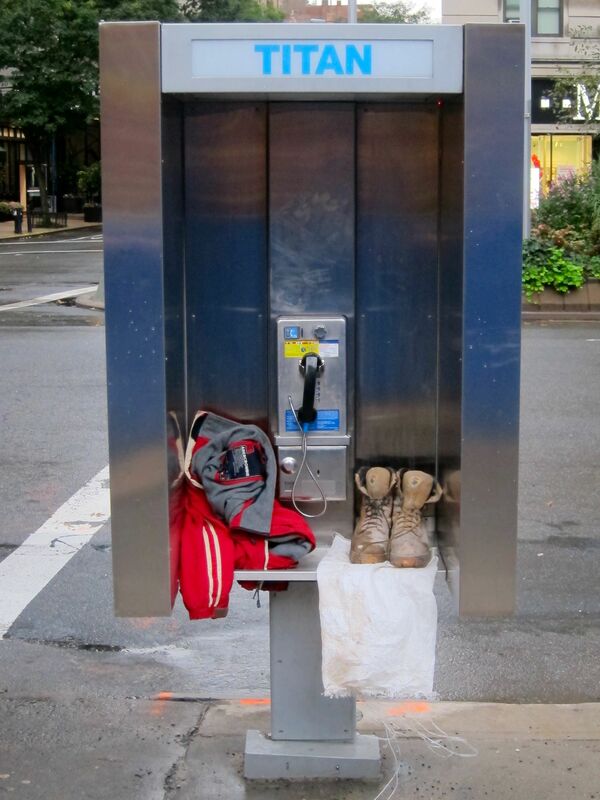 Plus this one on Broadway between 78th and 79th. 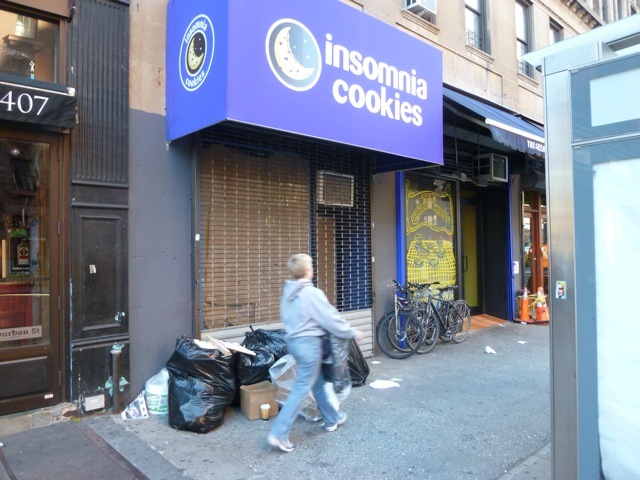 Insomnia Cookies on Amsterdam shows all the signs of a closed NY business. 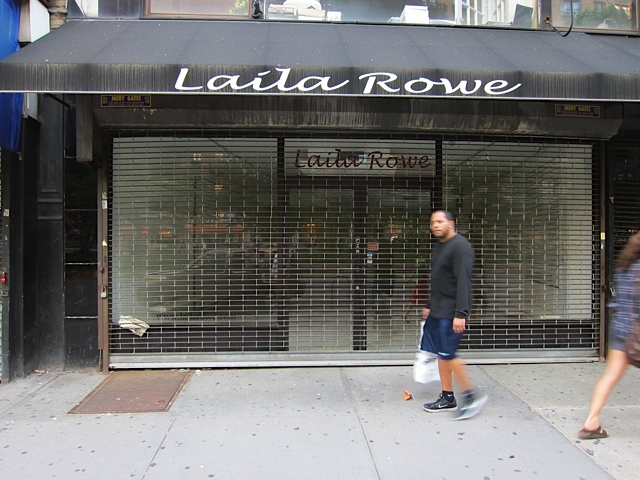 Windows papered over and barred and doors that don’t open no matter how hard you pull. 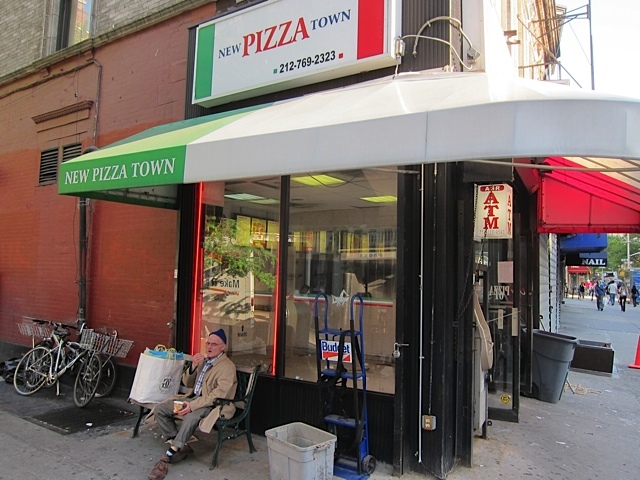 However, on closer inspection, the brightly garish awning does not appear to have ever been subjected to the mood swings of a full suite of New York City seasons. 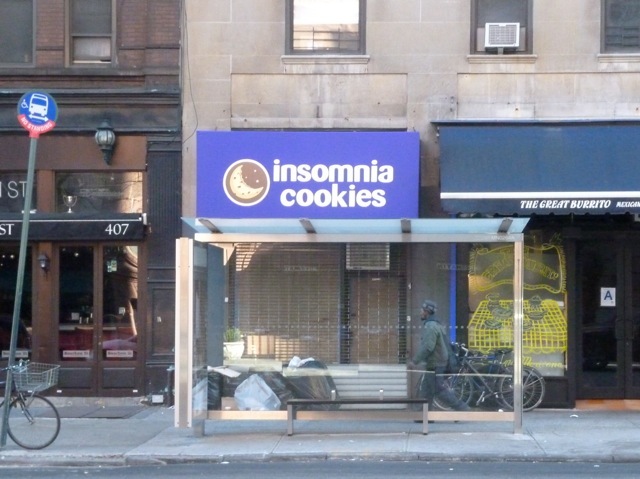 Plus I would have remembered cookies, good or bad, in my own neighborhood. 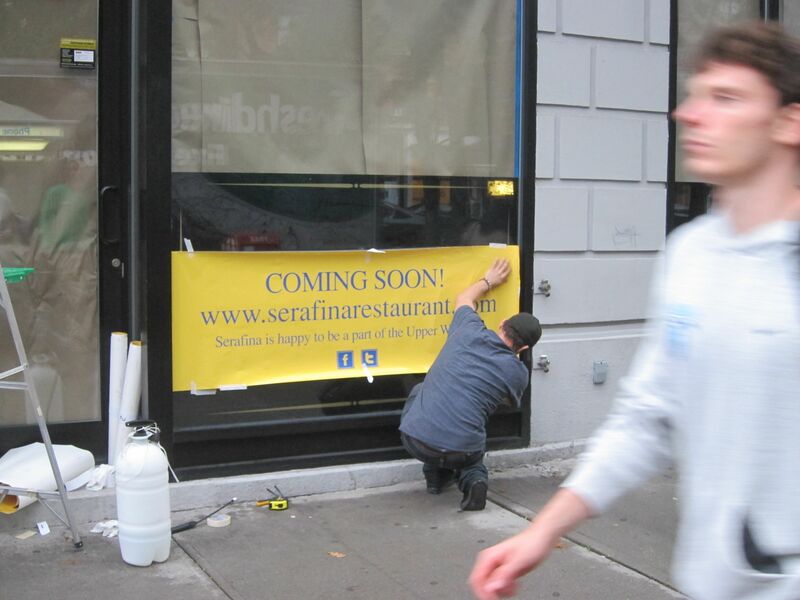 …and, then there’s this article announcing that it’s opening some time soon. When? Where are my cookies? Until there are cookies present and people coming and going eating them, this counts as a pre-closed business. Also, West Branch closed this summer, much to my disappointment amid widespread public indifference. 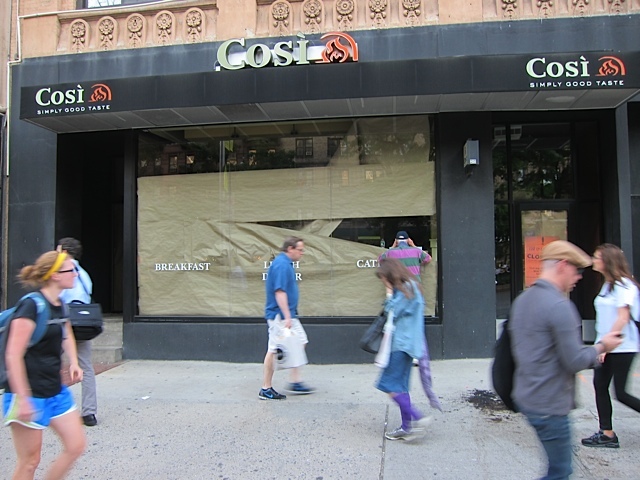 It lacked something and therefore, while usually busy, was rarely packed. The bartenders made a terrific martini and served decent beer. 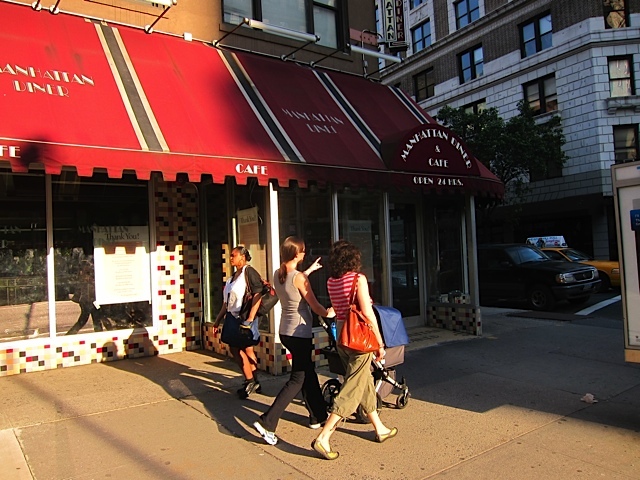 The UWS continues its mournful, desperate howl for good restaurants. 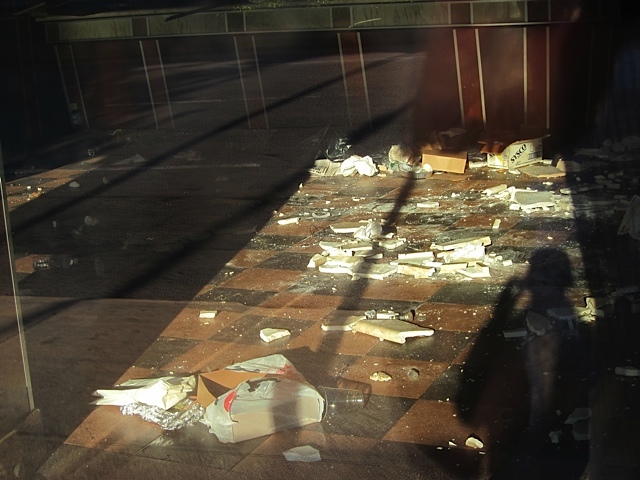 While capturing images of the long vacant CompUSA on 5th Ave. in the thirties, I came across this scene. Behind the glass, two women sitting on couches wearing bathrobes typing on laptops. People took pictures and video and stopped and watched. 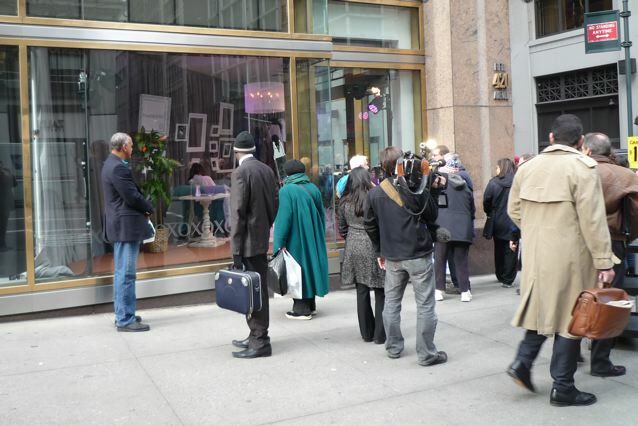 Which just goes to show you that if you stick live people in a window, put a few cameras on tripods in front of the windows, and draw a crowd, it can make Closed for Business. 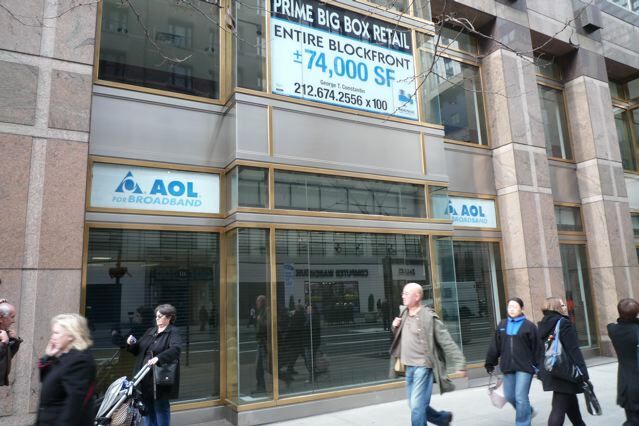 Anyway, the rest of the building stands unoccupied, a sign in the window begging for a big box store. I’d like to see a ping pong emporium there. A place for the young ‘uns to gather, bat the little white ball around in a well-lit, supervised environment where they can develop good solid values and skills they’ll use the rest of their lives. The boys can wear athletic-grade high-impact bow ties and the girls can wear lycra hoop skirts. 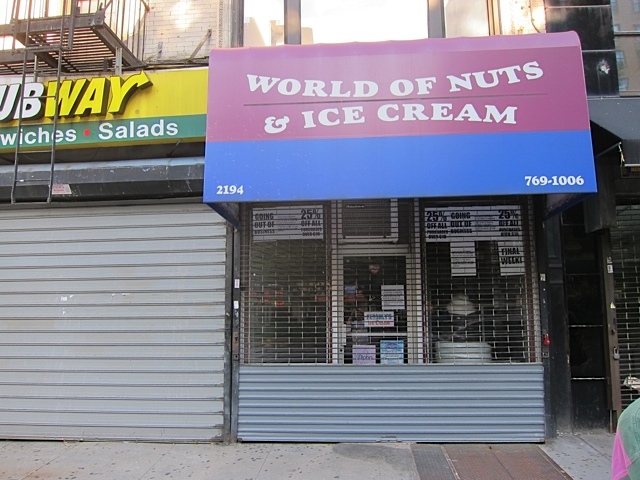 They can buy wholesome ice cream products, socialize and compete, all in the spirit of good, clean American fun. A day of wandering the Village and Washington Square Park along the streets of NYU… among tattoo parlors, pizza joints, head shops and holes in the ground awaiting replacement buildings. Looking like a tourist with my cargo shorts, baseball cap and camera dangling from my neck. 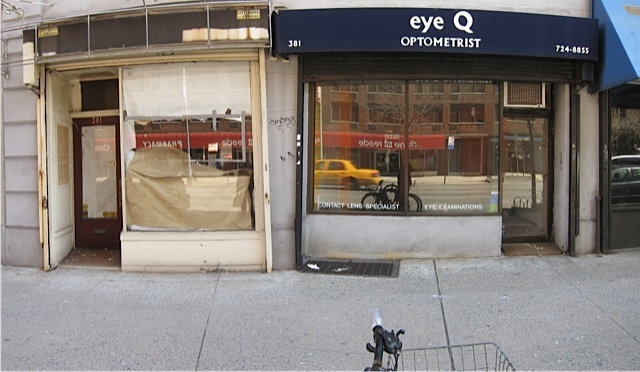 Bleeker and Christopher, another corner with two facing empties. Sign in yet another closed video store window, a segment of business quickly being killed by online video, netflix and on demand video. In St. Marks Place the deeds were done and done again as my life is done in St. Marks Place. Most places were open, a few places closed, but all the colors much brighter than anywhere else in the city. You’ll see. 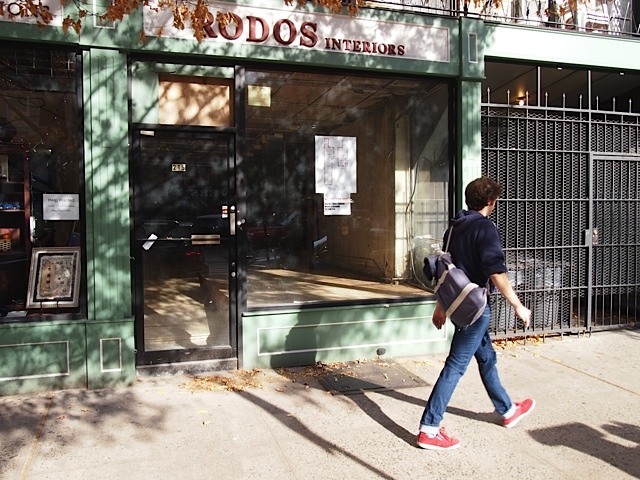 Is it open, closed, a business, a home…who knows… But it’s purple! This is the orange door you heard about. She made me promise to show things moving in, too.